No I'm really not. But sometimes my love of vintage and retro makes me feel like one. Take my new hobby, knitting. I love it but I do feel kinda old lady surrounded by all my gear at times. 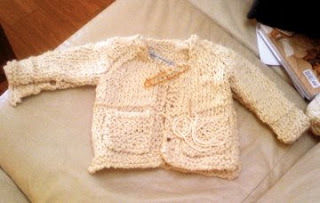 I was showing Daniel's parents my cute diaper cover and partially completed sweater and his mom remarked, "that looks like something Richard's mom would have had made for Daniel." I really did think it was funny and I don't mind having old fashioned tastes. This pic is of my mostly completed sweater, my goal is to have it done by Friday. Daniel and I are going to be driving a lot on Saturday and I want to start on my new diaper covers. I'm using thinner yarn and hopefully will get a less bulky diaper cover. I have enjoyed my bulky yarn, it knits up quick and hides my many boo boos.